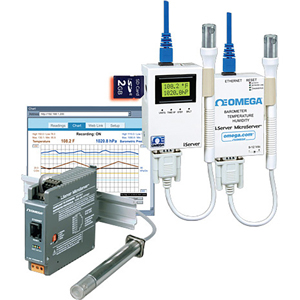 The OMEGA™ iBTHX transmitter lets you monitor and record barometric pressure, temperature, relative humidity, and dew point over an Ethernet network or the Internet with no special software except a Web browser. The iBTHX serves active Web pages to display real time readings; display charts of barometric pressure, temperature, and humidity; or log data in standard data formats for use in a spreadsheet or data acquisition program such as Excel or Visual Basic. The virtual chart viewed on the Web page is a JAVA™ Applet that records a chart over the LAN or Internet in real time. With the iBTHX, there is no need to invest time and money learning a proprietary software program to log or chart the data. Chart scales are fully adjustable on the fly. For example, the chart can display one minute, one hour, one day, one week, one month, or one year. Temperature and humidity can be charted across the full span (-40 to 85°C and 0 to 100% RH) or within any narrow range (such as 20 to 30°C). Barometric pressure can be displayed in hectopascals (hPa), millimeters of mercury (mmHg), or inches of mercury (inHg). The iBTHX transmitter comes complete with a barometric pressure, temperature, and humidity probe for measurement of a single location. OMEGA™ offers a choice of industrial probes in 5" lengths, and a wand style for ambient indoor applications. The OMEGA™ iBTHX is simple to install and use, and features OMEGA’s award-winning iServer technology that requires no special software except a Web browser. The iBTHX connects to an Ethernet network with a standard RJ45 connector and sends data in standard TCP/IP packets. It is easily configured with a simple menu using a Web browser, and it can be password protected. From within an Ethernet LAN or over the Internet, the user simply types an IP address or an easy-toremember name such as “Cleanroom 5” or “Midwest Server Room” in any Web browser, and the iBTHX serves a Web page with the current readings. All OMEGA iBT(H)X models that are on a LAN connected to the Internet can trigger an alarm that can be sent by email to a user or a distribution list anywhere in the world, including text messages to cell phones and PDA's. The OMEGA iBTHX is excellent for monitoring temperature and humidity in applications such as: clean rooms, computer rooms, HVAC systems, pharmaceutical/food processing and storage, hospitals, laboratories, semiconductor labs, electronic assembly, warehousing, museums, manufacturing, greenhouses, and farm animal shelters. The OMEGA iBTX-SD with LCD display adds several valuable features to the backlit local display of temperature and barometric pressure. The data is recorded on widely available SD (Secure Digital) flash cards. The format is a simple “.txt” text file that is easily imported to spread sheets and other programs. It can be read on a PC or MAC with a USB card reader. You can also download the data remotely over an Ethernet network or the Internet. The iBTX-SD features two 1.5 Amp relays. With the easy Web-based setup page, the two relays can be programmed for any combination of temperature or pressure, and high or low set points. The relays can also be programmed to remain latched and require a manual reset if a limit is exceeded. The iBTX-SD comes with a universal 100 to 240 Vac power adapter. A standard 9 Volt Alkaline battery (also included) allows the device to log data for up to 2 days without external ac power. A failure on the Ethernet network will not interrupt data recording. If you get a message about an alarm condition, you can quickly click on the link to view the actual scene over the Internet. iServer MicroServerTM for barometric pressure and temperature, with AC power adaptor. Includes standard wand probe, 152mm (6") cable with DB9 connector. Same as iBTX-W except with industrial 137mm (5") probe, 3m (10') cable with DB9 connector. iServer MicroServerTM for barometric pressure, temperature, humidity and dew point, with AC power adaptor. Includes standard wand probe, 152mm (6") cable with DB9 connector. Same as iBTHX-W except with industrial 137mm (5") probe, 3m (10') cable with DB9 connector. iServer MicroServerTM for barometric pressure and temperature, LCD display, 2 GB SD flash memory card, 2-relay alarm and battery back-up, with AC power adaptor. Includes standard wand probe, 152mm (6") cable with DB9 connector. Same as iBTX-SD except with industrial 137mm (5") probe, 3m (10') cable with DB9 connector.